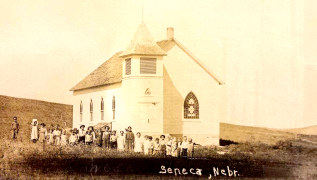 Seneca is a very tiny, quiet, community located on the south bank of Middle Loup River, north of Nebraska Highway 2 on the western edge of Thomas County just inside the Mountain Time Zone. The old auditorium has been restored to a wonderful community hall which is used throughout the year. The Seneca Turkey Dinner and Fall Bazaar is held in the auditorium the last Sunday in October. The proceeds from this annual event are the primary source of funding for the local United Church of Christ Church. The buffet dinner attracts ranchers, town folks and visitors from all over the Sandhills. Items featured at the bazaar include the community’s famous hand-ground horseradish, home-made jams and jellies from local fruits and wild berries as well as handmade items. The United Church of Christ still holds services each Sunday. The church was founded in 1909, celebrating their 105th anniversary this year. It remains a cornerstone of the community serving local ranchers and community families in the area.